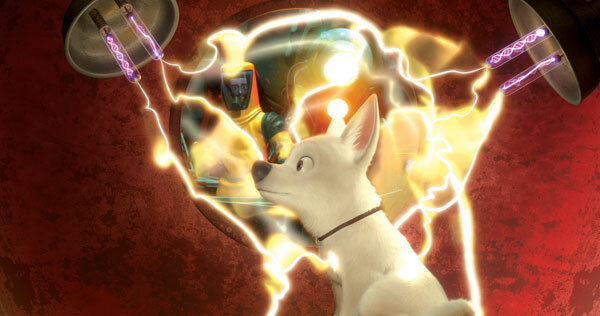 I just watched Bolt the other night, and to be clear, I'm talking about that CG animated feature made by Disney about the dog that thinks he has superpowers, not the more obscure live action film back in the 90's that had Michael Ironside in it. Now I know Pixar and Disney had some issues at one point, so I don't know if Pixar was involved with this film or not, but if I had to guess I would say NOT. Pixar movies always seem to have a lot more heart built into them, more interesting character, more significant events and interactions... this movie just felt average. We start with a dog who appears to be a superhero using all kinds of super powers to help out his master, a young girl named Penny. Now, we the audience already know from the commercials that Bolt is a TV start who eventually gets lost out in the real world, so I'm watching this and immediately have the same problem I did with the beginning of Tropic Thunder , which is the fact that audiences today know movies are not made like that, all in one giant 10 minute long shot with special effects going off all over the place. We've seen enough making-of featurettes to know how long it takes to setup one special effect, and how dialog scenes take many takes with various angles and lighting to be set up. 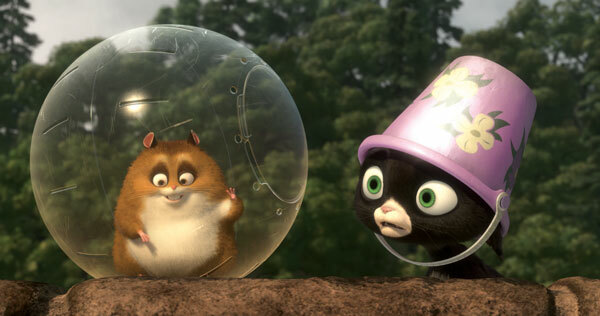 But, this is a kids movie, so I push that nonsense aside and try to get into it anyway. 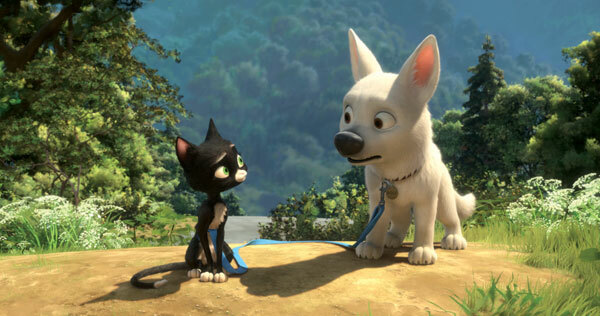 After the big long dramatic action scene we of course learn that Bolt is just a TV star dog that doesn't know he's a Hollywood star, he thinks he really has super powers. And the director makes sure of that because he says it makes the dog give a more realistic performance... er... okay... I'm just gonna let that one go as well. Now, shooting is over, but that means nothing to Bolt, so when he mistakenly believes that Penny is in trouble, he tries to rescue her by leaping through a closed window, at which point he knocks himself unconscious and falls into a box of Styrofoam peanuts which gets shipped all the way across country... because I can't tell you how many times I've needed to ship a box of Styrofoam peanuts across country. Who wrote this film, a bunch of third graders? 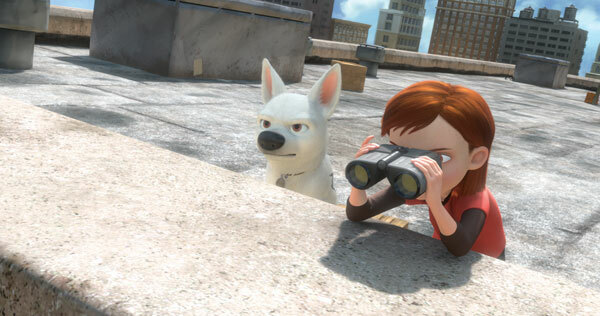 So now Bolt finds himself alone in New York City, still thinking that he's a superhero but confused as to why none of his powers won't work. He concludes that it must be the Styrafoam peanuts that drain his power... and that was kind of funny. How far are we into this movie before we finally get something that's kind of funny? 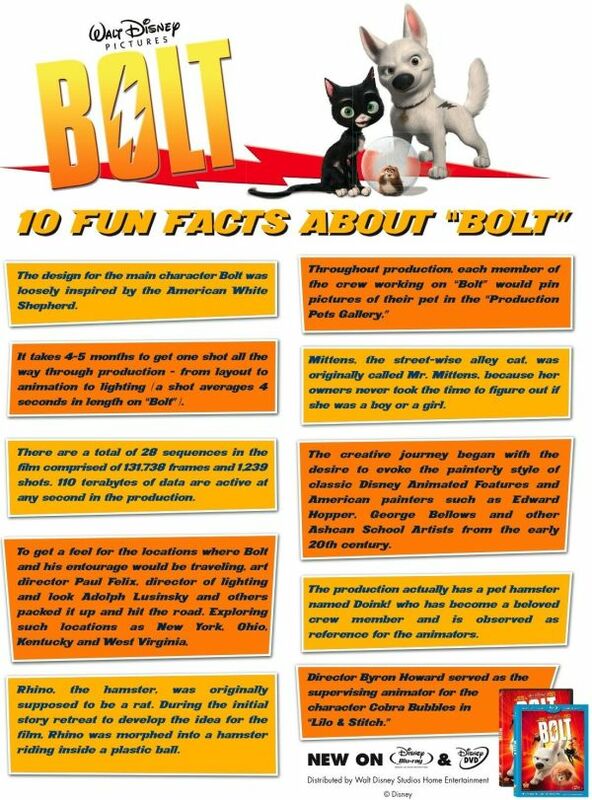 It's not long before he meets Mittens, an alley cat that looks similar to the one carried by Dr. Calico, the villain of Bolt's TV show, and thus he tries to get her to tell him where Penny is, and of course she has no idea what he's talking about. Somehow the two get tied together, and begin on an adventure to find Hollywood. 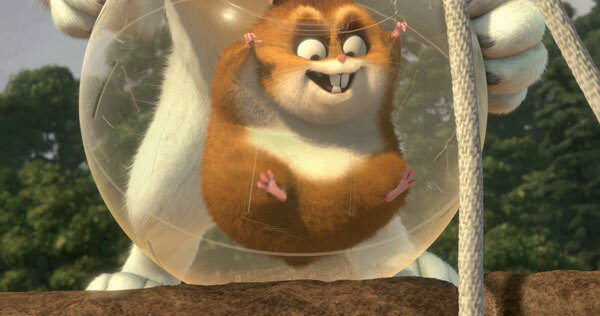 Soon after their adventure begins, they pick up a hamster companion named Rhino who loves to watch TV and is obsessed with his hero, Bolt. 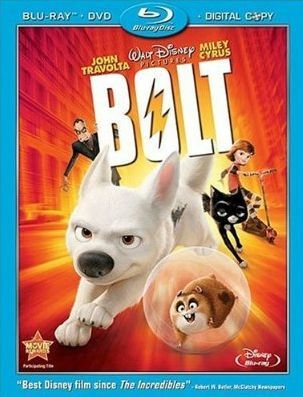 And even though Rhino watches Bolt's show on TV, he still doesn't realize that Bolt is just an actor. So he's kinda the dumb one of the group, and true to form, dumb is funny. This little guy is way more entertaining than Bolt or Mittens, or some pigeons that show up now and then. I'm thinking that I'm not the only one who realized this, because the DVD contains an animated short featuring him. By the way, on the Bonus Features DVD menu, one of the options is "Bonus Shorts", but clicking that brings you to a screen containing only a single animated short. So it should be "Bonus Short", and why even bother having it take you to a separate screen where you then have to select the one and only thing you can select (other than returning to the previous screen)? Just play the damn thing already! Why you wasting my time, fool! Other bonus features include deleted scenes, a few featurettes, and a music video. I don't really consider sneak peeks as bonuses. So the deleted scenes are really just rough animation with voice over, and they're nothing special. Three featurettes focus on the movie, one of which focuses on the voice actors, which I like to watch. The other focuses on the making of the music video with John Travolta and Miley Cyrus. I guess kids would probably like it, but not really my kind of music. Anyway, the movie was simple and plain, and I really think they could have spent more time crafting these characters and perfecting the story. Just nothing that special here.